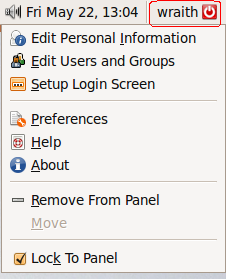 Different to other release,the latest version of ubuntu Jaunty has a confirm dialog within 60 sec. when you logout,shutdown or restart. It prevents anyone to make a mistake,but anyway it may be excrescent for some people and there is a easy way to disable it. You will see following screen,unmark the line which says “Show confirm dialogs for logout,restart and shutdown”and then close it,just so easy. 3 users responded in " Disable 60 seconds delay notification when logout,shutdown and restart ubuntu9.04 "
How do I reduce the 60 second delay, down to say 5 or 10 seconds. 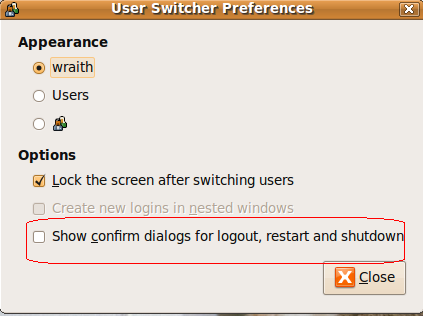 This doesn’t work in Karmic – all I get when right-clicking is the applet dialogue (“Remove from panel, Lock to panel). How do I turn off this extremely annoying shutdown delay in Karmic? Thanks.